One way to make sure that your business maintains quality standards is to ensure that you are maintaining employees who are adept to providing quality and efficient service. Company employees are your business’s front-liners, and the way they perform can affect your business. 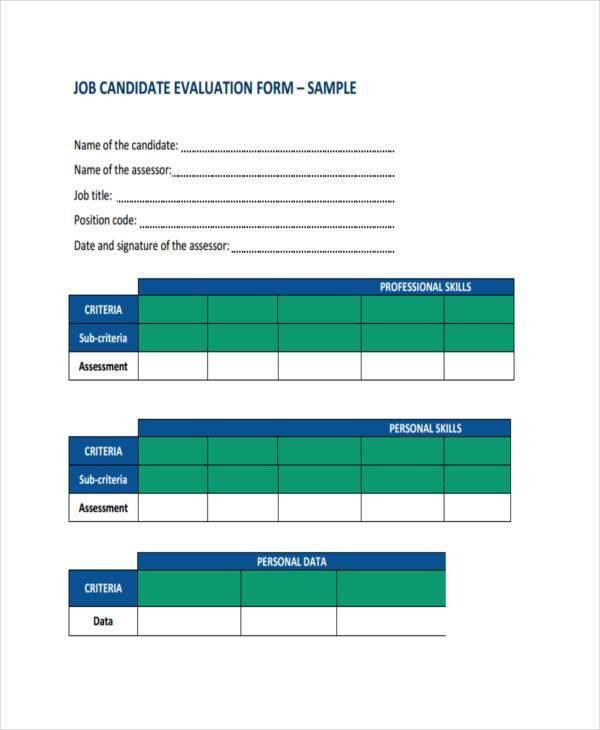 A Job Performance Evaluation is one of the most common procedures used by employers and managers in order to periodically calibrate an employee’s level of performance to see if it jives with the company’s standards and target goals. With the use of Evaluation Forms, managers and supervisors note down an employee’s ability to fulfill his tasks. 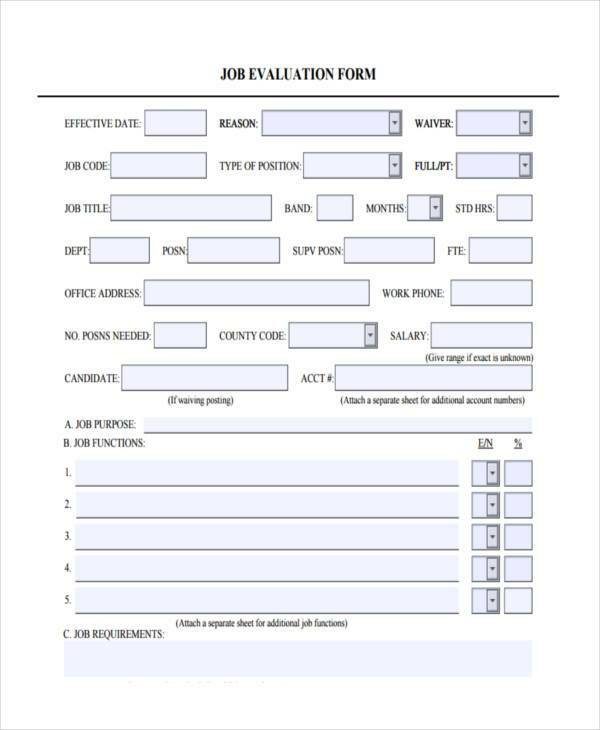 A Job Performance Evaluation is the process of periodically assessing an employee’s capacity, capability, achievements, skills, strengths, and weaknesses in order for a supervisor or a manager to gauge if he is doing well or not. If an employee is under-performing, a supervisor can then suggest or figure out ways to improve his weaknesses. 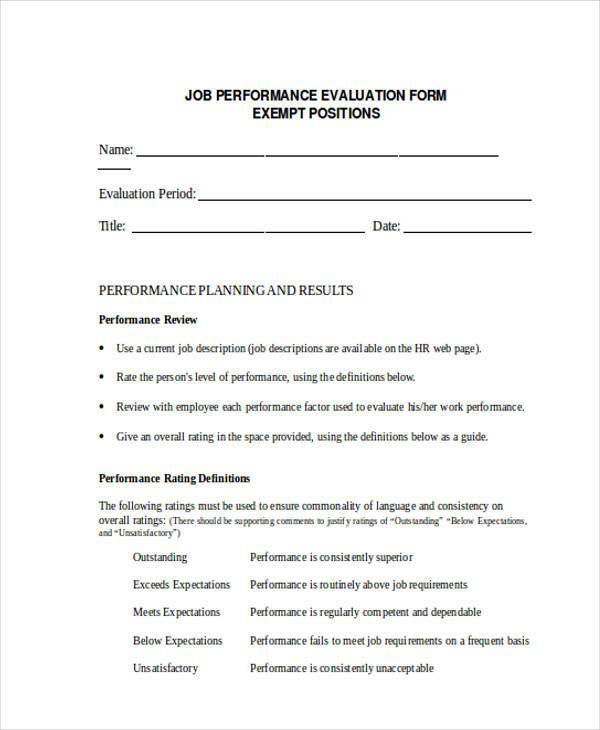 So why are Performance Evaluations important? 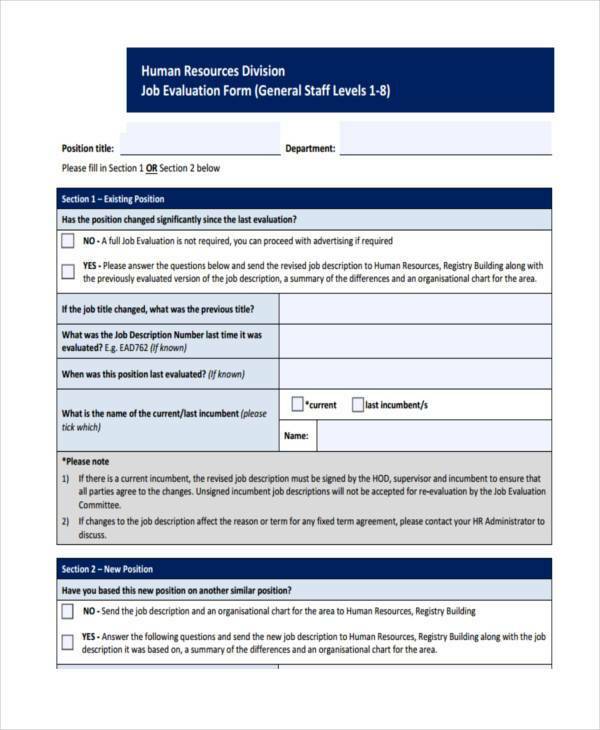 Periodic Job Performance Evaluations at work gives managers and supervisors an opportunity to properly and critically assess a worker’s strengths and weaknesses. Through this process, managers can help employees work on ways to improve on the skills that they are struggling with by providing the tools that they need or by providing refresher courses and training. A lot of companies conduct Job Performance Evaluations as a basis for an employee’s promotion or a salary increase. 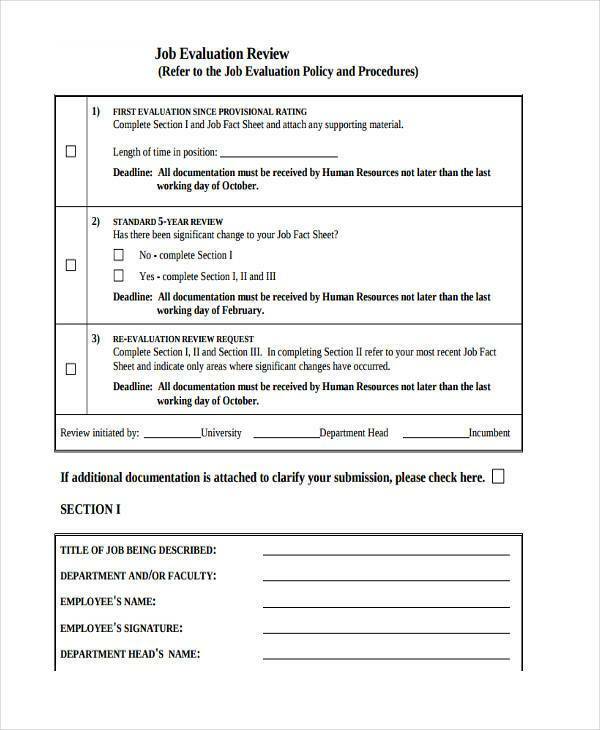 Most managers document the results of an evaluation to serve as supporting details or references for when the employee is being profiled for bigger responsibilities or is due for an appraisal, which is typically conducted every year during an employee’s anniversary in the company. After determining an individual’s strengths and weaknesses, employers or managers can establish a training and development program to address areas that need improvement. 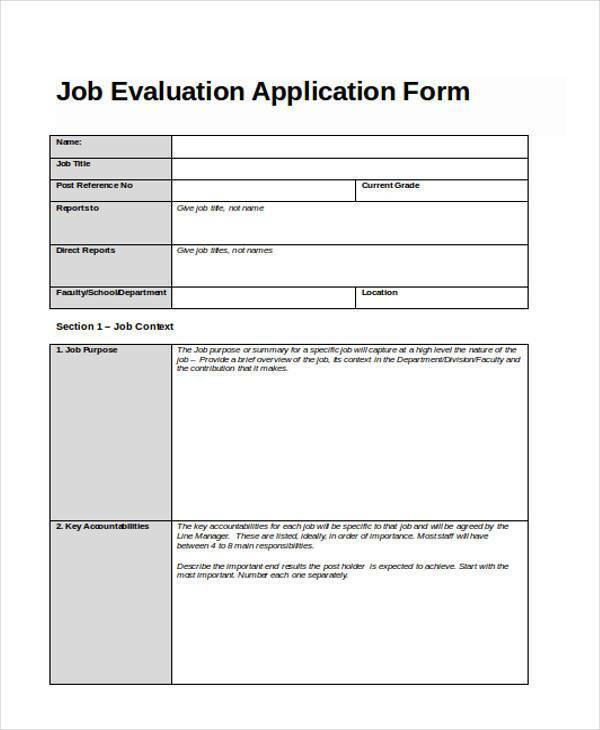 You can download and use our sample Job Evaluation Forms to help you provide accurate and well-organized feedback for your assessments. Job Performance Evaluations can also be a channel of communication between an employee and a manager. Through objective evaluations, the management can ensure that the workforce will be aware of their current performance. More so, having evaluations can promote a healthier working relationship between the employees and their employer. 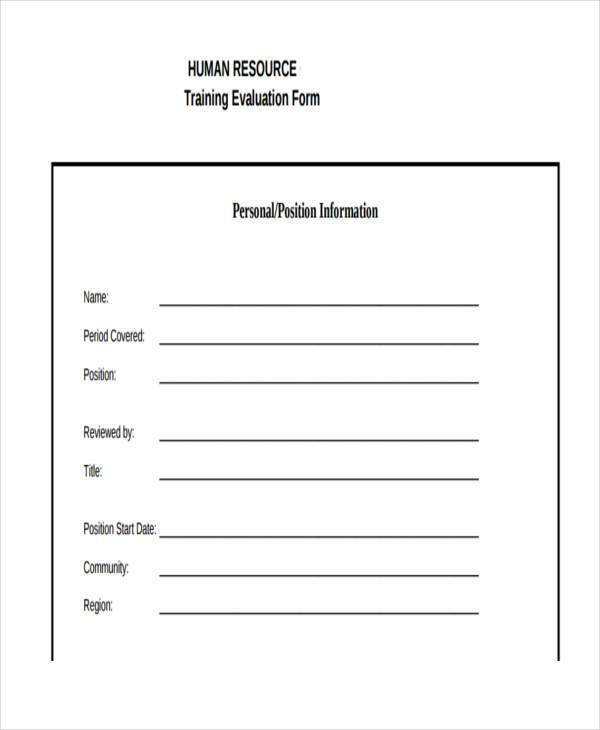 By performing performance evaluations periodically, managers and employers can recognize and reward good employees and will help employers be aware of the needs and concerns of its staff. 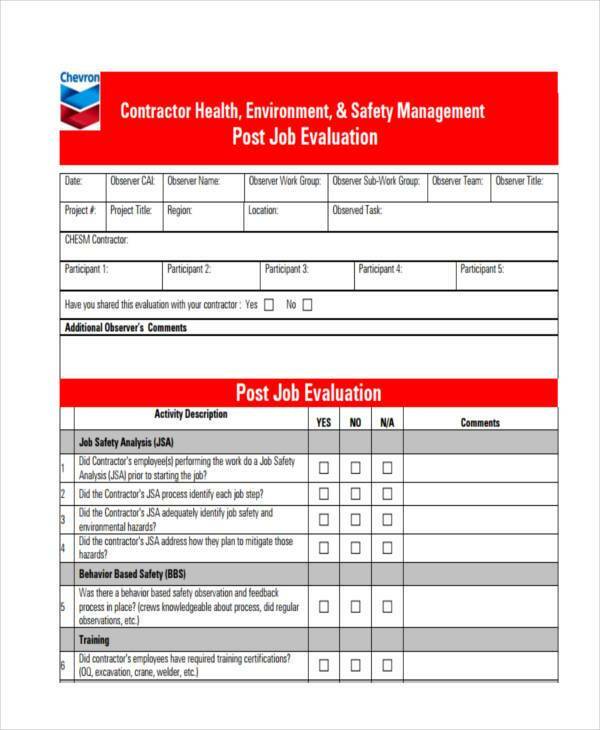 An employee evaluation can only be effective if there is already a set criteria that has been made by the management before starting the process of evaluation or assessment. The performance level of the employees should be based on the criteria that the company will implement and honor to make sure that the needs of the operations will be supplied. The standards that you would like to follow during the evaluation should be based on the nature of your business operations and the job functions that you expect your workforce to deliver. More so, you should consider the goals of the business and the call to actions that you are targeting to implement to achieve these goals. The duration by which the evaluation will take place must be properly and carefully documented. Employees may perform differently on various time duration especially if there are already factors that can affect the way they behave and do their duties within the work environment. 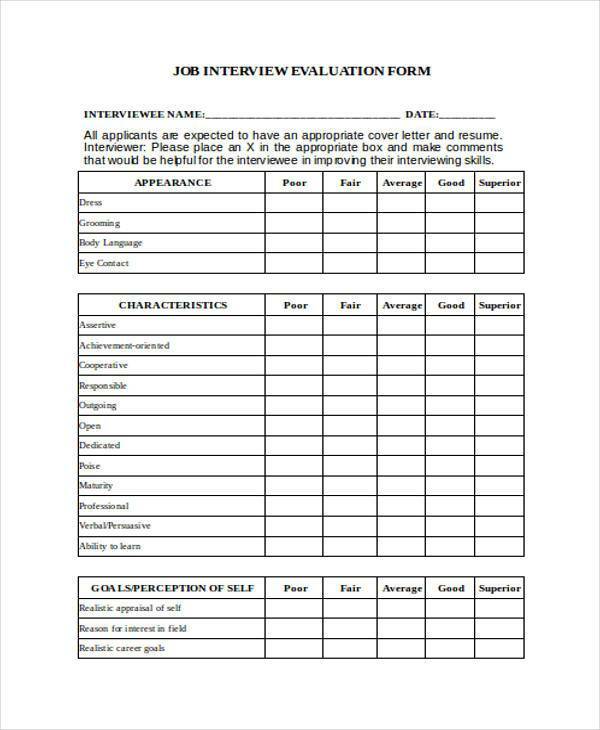 Make sure that the evaluations being implemented are well-recorded to identify the underlying factors on why employees perform the way they do, may there be any improvement or development or the other way around. 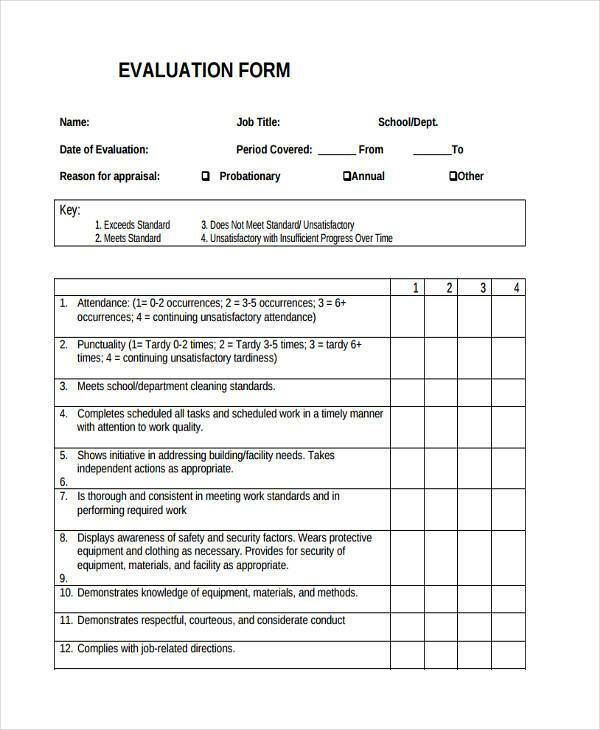 Use a Job Performance Evaluation Form so that your evaluations are accurate and well-organized. The evaluation given to an individual should have a follow-up or an explanation on why he/she gathered the kind of reviews that has been given to him. The full effectiveness of a job performance evaluation relies on how it will be taken by an employee. Always remember the evaluations are made to ensure that an employee will capitalize on his/her strengths to develop his/her weaknesses. Managers or even supervisors should plot a time where the evaluation results shall be talked about. During this time, employees should be appreciated by the work that they put for the achievement of the goals of the company. However, proper discussion of lack of work ethics or drive to perform better should also be stated accordingly. With an open communication about the results of the evaluation, it will be easier for the employee and the employer to be at the same page when it comes to their expectations from one another. This way, the corporate objectives of the business will be realized while letting the employees grow as professionals as well.